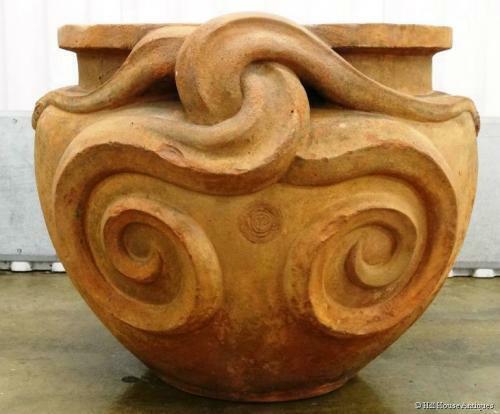 A good example of a very large Compton Potters Art Guild terracotta planter/jardiniere - the "Cobra or Snake Pot". The pottery was started by Mary Seton Watts (wife of famous Victorian artist GF Watts) at Compton, Surrey. Much of her output was also made for and retailed at Liberty & Co at the time, who also had their Archibald Knox Celtic style garden ornaments made at Compton. Circa 1900. The Potters Art Guild "wheel" mark externally plus potter`s incised initials "RW" inside. This is the largest size they did; approx 20" high and 24" overall external diameter. Excellent provenance; ex- Hever Castle.